Every year, the Friars in Spanish Florida were allowed 26 varasof sayal wool by the King of Spain for the manufacture of their habits. This material was part of a special allowance from the crown called the “alms for habit and sandals,” which was in addition to the funds already set aside for the friars’ subsistence, supplies, and church ornaments. Beginning in 1616 this “religioso” fund was combined with the official situado for Florida, and the realization of the materials arrival in Florida each year became just as variable. The reasons for this sporadic delivery will be discussed at a later date, but it was through this system that sayal came to Florida’s shores. However, was this sayal wool the same as the mid-grey plain woven coarse woolens used for habits since the orders foundations? The word sayal entered the Spanish language in the 13th century; ironically the same time the Franciscan order was originating and spreading. At the time, however, sayal referenced “tela basta de estopa y pelo de cabra;” a coarse cloth of tow fibers and goat hair. This material was commonly used by rustic highlanders inhabiting the mountains of Zamora in Leon, and by the 16th century the use of the fabric to represent the rusticity of a character became integral to the comedia genre of Spanish theater. This relationship between sayal and the social standing of its wearer persisted as late as 1743, when “the poor Country-People about Zamora are call'd Sayagos from Sayal, a coarse Sackcloth, their usual Cloathing, hence any poor People, especially Mountaineers, are call'd Sayagos.” Do note that by the 18th century, the term has adopted its generic use for coarse sackcloth as opposed to a specific tow and goat hair material from the thirteenth. It is also important to note that currently, we do not know when the shift of the Spanish term sayal from this specific composite fiber material to a completely wool cloth occurred in the 300 years between its first documented use in Spain and when it began to be used in the comedias. However, by the time of the Florida missions, Sayal specifically referenced coarse woolen sackcloth associated with friars, peasants, and rustics. For Franciscan friars between the late 16th and 18th centuries, the most common color sayal fabric was grey, following the tradition we examined earlier. This use of grey was so prevalent, that in England they were known as “grey friars” and many landmarks and roads there still hold that name. The grey color of the habit materials was obtained by mixing the wool of grey/black and white sheep, not as we do today by mixing the fibers within a single thread, but by using one color in the weft and another in the warp. Grey may have been the standard color for habits during this period, but other colors were also available and used. Just as the grey is derived from the natural colors of the sheep, brown fleeces were also used at times and periodically one will see European paintings from the period showing various Franciscans in a brown habit instead of grey. While there almost certainly were brown habits in use during the period, all evidence we have regarding the Spanish friars operating in La Florida point to the use of grey habits. "August 30, 1596- “…1,745 varas of blue sayal, 643 varas of blue and black sayal; 276 varas of sayal pardo...assorted sayal in blue, yellow, and mixed, totaling 457 varas." "February 11, 1599- “…1,000 varas of blue sayal"
"May 3, 1599- “…791 varas of blue sayal..."
"September 1, 1599- “…998 varas of blue sayal; 238 varas of blue and black sayal; 512 varas of brown (or dark gray) and white sayal; 309 varas of blue and white sayal...2 large pieces (42 and 44 varas) of sayal, one blue and one mixed..."
"October 25, 1599- “…3,650 varas of blue sayal; 2,168 varas of blue and black sayal; 842 varas of blue and white sayal; 839 varas of white and pardo sayal..."
"March 24, 1604- “…1,492 varas of sayal (blue and blue and white), tied with 35 varas of coarse frieze (jerga)..."
"April 10, 1604- “…895 varas of blue sayal; 408 varas of blue and white, blue and black, and blue and pardo sayal..."
"July 24, 1605- “…1,500 varas of sayal (1,000 blue and black, 500 blue)..."
As these shipments make clear, the term sayal did not limit itself to un-dyed homespun fibers during the period in question, and as such the term must have been specific to the type and quality of the cloth itself as opposed to the fibers and colors in which it was composed. The quality of sayal wool, however, was not universal. In a list of gifts given to Timucuan and Guale caciques who visited St. Augustine between November of 1597 and March of 1602, there were two references to “common sayal cloth” (on March 28 and June 26, 1601), meaning there was an understood median standard for sayal during the period which we have yet to discover. However, this “common” variety was not the only quality sayal used in La Florida, as four years previously in July of 1597, Governor Mendez de Canco gave “20 varas of sayal fraylesco fino [fine woolen friar’s cloth]” to the mandadores and principales of Timucua. Stepping outside of Florida into the rest of the Spanish Empire in the New World, a third quality of sayal wool comes to light. In his 1612 report to Pope Paul V, the Franciscan Commisary General of the Indies, Fr. Antonio de Trejo made reference in relation to the order in Peru of “un habito simple de sayal grueso” (a simple habit of thick sayal). These are but a handful of numerous references showing that additional adjectives were necessary to describe the quality of sayal, be it fine, common, or thick. In attempting to understand the exact nature of the term sayal, it is clear that neither the fiber composition (be it type of fiber, despite wool becoming standard by our era of interest, or color) or the quality are what is specifically being referenced by the term. Other terms, such as Jergueta, were also being used during the period to reference coarse homespun materials, which leaves the actual weave of the cloth as the only possible identifier that would make sayal unique from any of these other similar fabrics. With sayal having not been produced in over 200 years, and with no known examples, is it possible to identify this weave? Was it just a simple plain weave like the 13th century sack-cloths used in the earlier habits? Just how close can we understand the complete nature of sayal wool, and just how accurately can we reproduce it? There is absolutely no substitute to having a garment or fabric swatch, with a solid provenance and clearly identified by contemporaneous persons. However, many times such a gem does not exist and we are forced to examine other resources to try and piece together as much information as possible. Such is the case when it comes to the actual type of wool that was sayal. Without known swatches, and so far no documentary records describing the fabric in any detail (the authors generally assuming their readers were familiar with the fabric), we are left to examining artwork from the period. While many times artwork must be taken with a grain of salt, it can also be a useful tool depending on the time frame of the paintings and to what extent there is further collaborating evidence. Fortunately for us, the time between 1560 and 1763 was an era in which detail and accuracy were important to artists in their attempt to capture the true, natural, elements of their subjects. In a survey of artwork during the period which showed contemporaneous Franciscan habits, we found varying levels of detail in the art. Most paintings merely focused on the myriad of colors in a patched and dirtied Franciscan tunic, but conveniently for us a number of artists were even more detail oriented and provided us an insight into the actual weave of the cloth used in the friars’ habits. Many times, artists will just use lines to fill in open spaces or to show that something has texture without necessarily defining the textures exact nature. This is why, upon examining the 1660 Rembrandt painting of his son Titus attired as a Franciscan friar we noticed the regularity of the striped pattern along the shoulder detailed below but were not confident enough at the time to say with any certainty that Rembrandt was showing twilled wool being used. At the time, this small detail was put in the back of our mind as we were more interested in trying to find SPANISH picture of Franciscan friars, in an attempt to get as close to the friars who served in La Florida as possible. One of the most important artists during the Spanish Renaissance was Doménikos Theotokópoulos, commonly known as “El Greco,” who moved to Toledo, Spain, in 1577 and worked from there until his death in 1614. Shortly after this move, around 1580, El Greco painted the following work titled “The Ecstasy of Saint Francis.” Yet again, we noticed a few places that appeared like they might be twill lines at regular intervals, but without enough detail to be conclusive. We were especially interested in the turned back cuff, as the lines follow the same pattern as if a twilled woolen had been turned back on itself. El Greco also included this element, of portraying a coarse texture to the wool that might potentially be twill woven, in two more of his paintings. The first is of Saint Francis receiving the stigmata, executed between 1585 and 1590. And the third work that shows the texture of the material and hints at a twill weave is his painting of St. Francis and brother Leo meditating on death, c1600-1602. While extremely fuzzy in execution, it is interesting that many of these parallel texture lines follow the same patterns over the folds and wrinkles of the habit just as twill woven cloth does. A student of El Greco during his sojourn in Toledo, Diego de Astor, also included this detail in the sketch he made of the above painting by his tutor. Sketches, done in pen and ink, generally include straight lines in empty spaces to differentiate areas and textures but the ones included by de Astor show remarkable regularity and also resemble the reactions of a twilled material. The chest area of Saint Francis shows the possible twill weave most clearly. El Greco and his student Diego de Astor were not the only artists at the turn of the 17th century to depict texture on the habit material of their friar subjects. Born in Extremadura on November 7, 1598, Francisco de Zurbaran began his artistic career in 1614 under the painter Pedro Díaz de Villanueva. Sometimes referred to as the “Spanish Caravaggio,” Zurbaran became well known for his religious and still-life paintings. While not reminiscent necessarily of a twilled cloth, Zurbaran in the detail below of his depiction of Saint Francis’ stigmata clearly shows a regular texture to the weave of the cloth used in the habit. Yet another Spanish artist from the period showed the cloth used in Franciscan habits as having a texture reminiscent of a twilled wool. Born in Aviles, Juan Carreno de Miranda began his painting career in the late 1620s. In his painting of the Franciscan martyrs from Japan, a detail of which is below, he more clearly shows a distinctive twill weave in the fabric. The diagonal lines flow seamlessly over the wrinkles and folds of the habits when worn, exactly as a twilled fabric does when worn. This phenomenon is very clearly seen on the sleeves of the martyrs. Born in Lleida, Spain, the artist Francisco Ribalta is the first to clearly show what is unmistakably twilled wool being used in Franciscan habits of the period. Painted c1620, a detail of his painting of an angel visiting Saint Francis is shown below. The arrows are pointing to the areas where the twill weave, and how it reacts with the drape of the cloth, are most clearly seen. Originally from Florence, Italy, the artist Vicente Carducho moved to Spain at the age of nine where he apprenticed as a painter under his brother. In 1631, he painted two works, both of which show Franciscan habits made from a twilled wool material during the period. The first is his vision of Saint Francis (detail, left) and the other his vision of Saint Anthony (detail, below). Another detail from Cigoli, a portrait of Saint Francis painted between 1597 and 1599. This final Italian detail is most intriguing, as its creator had joined a Capuchin (reformed branch of Franciscans) monastery at the age of 17. Painted by Bernardo Strozzi in 1625, the same year he was charged for illegally practicing as a painter, his Miracle of St. Diego de Alcantara clearly shows the twilled texture of the wool used in the habits. As an increasing number of paintings surfaced showing this twilled pattern in the fabric used on Franciscan habits during our period of interest, we began asking ourselves “was the sayal wool used by the Florida friars a twilled cloth?” We began to think that there was a definite possibility that over the three hundred years since the early habits we examined earlier, that the cloth had shifted from a plain weave to twill. That was when we discovered the following wooden statue, located in the sacristy of the Cathedral in Toledo, depicting Saint Francis and attributed to Pedro de Mena who carved it at some point during the 1650s. It clearly shows that what we were seeing as twilled wool may certainly be that, and not just a random artistic technique, as he included the texture of the material into his carving. These artistic pieces have showed us that Franciscan friars, at least in Europe, were utilizing coarsely woven twilled wool for their habits. Sayal was referenced as the name of the cloth used for these habits both in the Old World and the New, so we began to wonder if this twilled wool was in fact the same sayal wool that was used on both sides of the Atlantic. The following is a depiction of Fray Juniperro Serra, who founded the missions in California during the mid-18th Century. While the anonymous artist did not detail twilled cloth exactly, they used regularly spaced lines to show that the habit had a specific regular texture just like the early Spanish paintings above. Did the term sayal refer specifically to coarse, homespun, twilled wool during the period of the La Florida missions? Until an original sample that is clearly identified as being sayal is discovered, there is no way to tell with complete certainty. What we do know, based on our examination above, is that the Franciscan friars during this period were wearing coarse twilled wool, most commonly a shade of grey derived from a grey/black weft and white warp, on both sides of the Atlantic. This is the first break made by Franciscan habits during the 300 year span between the orders foundation and our period of interest, no longer remaining plain woven sackcloth. In future posts we will be exploring other details which changed over the years, such as the evolution of sleeve shapes. When it comes to recreating a Franciscan friar during the period (1565-1763), it is important to get the details correct as they are what made him unique from a Franciscan in any other period. A starting point is with the fabric used for the habit, as this twilled “sayal” wool was only used between the 16th and 18th centuries, with most Franciscans returning to normal plain woven cloth in the 19th century. It is a very subtle detail, but an important one, as most audiences today are visual by nature and they are more likely to remember what they saw than what you said. When sourcing fabric for your habit, you want to look for mid-grey wool in a twill weave. The weight of the fabric can be variable since, as we saw above, sayal was available in fine, common, and thick categories. Surprisingly, finding a twilled woven grey wool is not as easy today as one might think, and it took months to source the material in our prototype habit (pictures coming soon). Even then, we had to settle with “the best available.” We hope in the near future as part of the La Mision project, to actually weave some proper twilled sayal wool using handspun yarns from grey and white sheep, experimenting with various twill structures (2/1, 2/2, etc.) to replicate the drape and construction seen in the above and other pieces of artwork. In the meantime, however, our prototype habit matches the pattern and construction methods (to be discussed later) of Franciscan habits from the period, and though the fabric is woven on a modern machine it is a good approximation of “sayal fraylesco fino” and light years more suitable for public interpretation than the habits generally worn by friar interpreters. Amy Turner Bushnell, Situado and Sabana: Spain’s Support System for the Presidio and Mission Provinces of Florida (Athens, Ga: University of Georgia Press, 1994), 55. Charlotte Stern, “Sayago and Sayagués in Spanish History and Literature,” Hispanic Review Vol. 29 No. 3 (1961): 225. Miguel de Cervantes Saavedra, The History of the Renowned Don Quixote de la Manche, trans. Anonymous (London: Mr. Ozell, 1743), 291. Bushnell, Situado and Sabana, 55. Philip Wayne Powell, Soldiers, Indians & Silver: North America's First Frontier War (Los Angeles: Univ. of California Press, 1952), 283-285. John Worth, The Timucuan Chiefdoms of Spanish Florida, Vol. I: Assimilation (Gainesville: University of Florida Press, 1998), 55. Lazaro Lamadrid, “Report on the Missions by the Franciscan Commissary General of the Indies (1612),” The Americas Vol. 2 No. 4 (1946): 497. When portraying a man of the cloth, it is important to start with the right materials in the construction of your habit. In Saint Francis’ third and final rule for the ordo fratrum minorum, it was stipulated that “...those who have promised obedience take one tunic with a hood, and let those who wish it have another without a hood….All the brothers are to wear inexpensive clothing, and they can use sackcloth and other material to mend it with God's blessing.” Ever since, the use of coarse woolen sackcloth has been an integral part of the Franciscan experience. In Spanish the term for sackcloth is sayal, and at the time of the La Florida missions (1573-1763) was the fabric most used in the habits of these Franciscan friars. Despite its widespread employment, however, no known example of sayal survives today as its use declined toward the end of the eighteenth-century and has not been manufactured since. So what do we know about sayal? Is the Spanish sayal at the time of the missions the same as the sackcloth used by the earliest Franciscans, or did it change over the almost 600 years “sackcloth” was in use by the friars? What exactly is sayal? And how do we incorporate what we know in reproducing an appropriate habit for doing living history portrayals as a Florida Franciscan friar? Francis, rejoicing in the spirit of God, said, "This is what I want! This is what I'm looking for! This is what I want to do from the bottom of my heart!" Thus the holy father, overflowing with joy, hurried to fulfill those healing words….He took off his shoes, tossed away his staff, was satisfied with a single tunic, and exchanged his leather belt for a cord. He made himself a tunic that looked like the cross so that he could beat off the temptations of the devil. It was rough in order to crucify the vices and sins of the flesh. It was poor and mean so that the world would not covet it. With the greatest diligence and reverence he tried to do everything else that he had heard, for he was not a deaf hearer of the gospel but, laudably committing all that he had heard to memory, he diligent1y attempted to fulfill them to the letter. 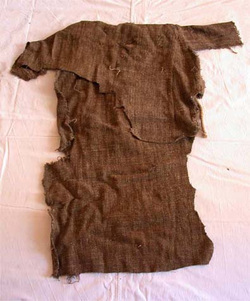 This rough, poor, tunic was most likely sackcloth or very similar to it, and was eventually adopted by the rest of the early Franciscan community. A number of tunics that have been attributed to Saint Francis remain in existence. The first is housed in the Basilica Papale di San Francesco d’Assisi, in Assisi, Italy. It is unique in that it is made of slightly fulled twill wool, and is partially lined in linen. This particular tunic also has more of a secular cut to it, being closer to a kyrtle or frock from the early 13thC than a religious habit. Assuming this garment actually was worn by Saint Francis, it would most likely be a candidate for the habit he wore during his first three years of chapel renovations. A fulled twill wool would have been a poor quality cloth from that which Francis had worn in secular life, but was still a finer cloth than the woolen sackcloth he would adopt at the Portiuncula. For more detailed information on this tunic, please visit I. Marc Carlson’s page at http://www.personal.utulsa.edu/~marc-carlson/cloth/francis.htm. The photos here are from a 2007 Reuter’s article and taken by Daniele la Monaca. This next picture is also from Assisi, showing Franciscan relics on display at the Basilica di Santa Chiara. I have not been able to find out any information on the tunic fragments at left, but the middle habit is suppose to be the tunic and cloak of Saint Clare. On right is the tunic claimed to have been worn by Saint Francis, along with a breviary and cincture attributed to him as well. This next habit attributed to Saint Francis comes from the Sanctuary of La Verna, which was built near the location Francis received the stigmata. For more information on the tunic itself, see http://digilander.libero.it/ancilla/english/laverna/saio.html. These next two tunics attributed to Saint Francis are most interesting, as they have been the only ones to undergo carbon-14 dating in an attempt to explore their authenticity. The tunic in front belongs to Santa Croce church in Florence, and the one behind is possessed by the Church of San Francesco on via barrettini in Cortona, Italy. Based on the results of the 2007 carbon-14 testing, the Cortona tunic shown left was found to date between 1155 and 1225, which falls within the lifetime of Saint Francis. While there is no way to prove the tunic actually was worn by Francis, the fact that it dates to the correct time and is thought to have been brought to Cortona by Brother Elias along with a cushion and book of gospels (which also date to the same era), increases the likelihood. A fragment of the Santa Croce tunic is all that is on display, along with a cincture which was also attributed to Francis. This particular section of the La Mision website is where I will be sharing my research into the actual dress/costume of the Friars of the La Florida missions and the process of replicating in as exacting detail as possible the said outfit(s). Recently I finished my prototype habit, and will be adding pictures of it along with my posts on topics such as "Having a cow-l ? : Two styles of Habits" and "Men of the Cloth and Their Fabric of Faith: Rediscovering Sayal Wool" among others. The only exception I made in my prototype habit was that I used the closest machine woven wool that I could find to the historical materials (and I got it REALLY close), but as the purpose of this project is to replicate the mission experience as accurately as possible and then use the recreations for high quality educational programs on cultural contact, I hope to eventually build an authentic loom and handweave the appropriate fabric for habit #2....a fabric which has not been produced in almost 300 years. The habits during the mission era had their own distinct style, and I hope that this section of the website will be informative to those who try to replicate a Franciscan friar between 1560-1750 as a polyester "Friar Tuck" costume from a shop just is not accurate....and to be accurate is to be respectful of our forebears as it is an attempt to portray who exactly they were, and their actual experiences as honestly as possible.